Lab found traces of mescaline and alligator. Street name is Tangy BBQ. 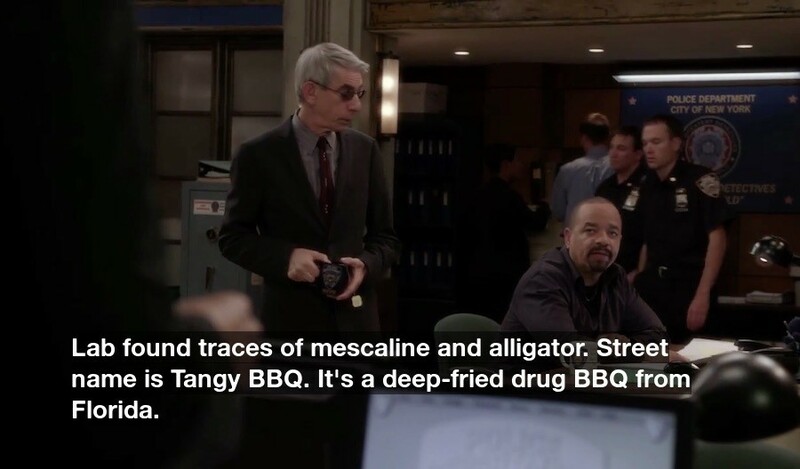 It's a deep-fried drug BBQ from Florida. Anti-fascism is largely a praxis of resistance--an often uncomfortable coalition in undercutting a dangerous ideology. Anti-communism, however, seems to often define some d-bags' entire political philosophy. It's pretty much the definition of "reactionary" to base your ideas on "I just hate this one particular thing." A thing which, to be honest, has defined so many human relations, familial and communal, long before capitalism came about. love how Mark Russell was given a Wonder Twins all-ages comic and he was like "hmmm i should use this as an opportunity to critique for-profit prison systems and exploitation of prisoner labor"